Comparing services within the mountain guiding industry is not an easy task! With a manufactured product, which might be available from several different stores, you can compare prices, size up the merchant, and determine value relatively quickly and accurately. With mountain guiding services you are still faced with the task of comparing prices, but the “product” is different for each purveyor  sometimes immensely different. A slightly more expensive “product” that offers far more benefits is obviously a better value, but how do you determine what benefits you will receive? The sections below are intended to help you make an informed decision when purchasing mountain guiding services. We have attempted to be as objective as possible in presenting this information but it is ultimately based upon Our Values which tend toward personalized, high-quality, low-impact experiences. We hope the information below will assist you in making important decisions about the kinds of services you desire. We also hope it will help you ask the right questions so you can determine if you are likely to receive those services. No matter what choices you make, we suggest you “test the waters” with any company or guide before booking the trip of a lifetime. 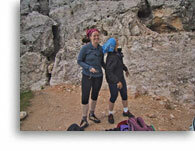 You will need to look at several distinct aspects of mountain guiding to arrive at a useful picture for comparisons. 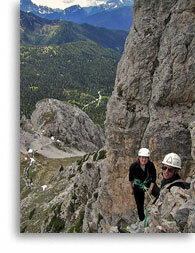 A wide variety of services can be found in today’s mountain guiding industry. 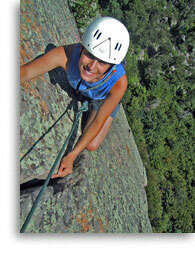 A skilled guide can add a higher level safety and improved odds for success to most adventures. 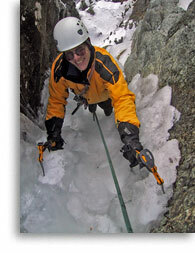 A talented instructor (commonly referred to as a guide) can help you master a wide variety of skills in the mountains. 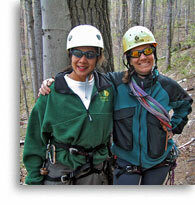 Often, seasoned guides will also provide an informed historical perspective, colorful entertainment, and camaraderie. Professional mountain guiding pairs you with a skilled guide so, together, you can achieve adventure objectives in the mountains. Characterized by an inherently personalized relationship that allows objectives to be tailored to your interests and abilities, it is the only form of guiding that permits the flexibility required to attempt truly demanding objectives. 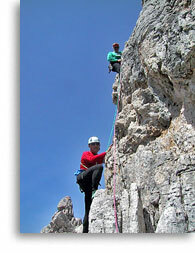 Professional mountain guiding, depending upon the objective, typically is conducted with one or two clients per guide. Occasionally, in less demanding environments, a third (and rarely a fourth) client may be added. Beyond four clients per guide, the compromises a guide must accept in terms of supervision and flexibility result in the more limited form of guiding we call a “supervised mountain experience”. Effective mountain guiding can only take place safely with clients who have already acquired essential skills for the chosen objective. In all cases basic skills are essential and, for more demanding objectives, advanced skills may be required. In other words, if you are a beginner you will need some instruction before you can be guided effectively and safely. Professional mountain guiding companies are in the business of helping you maximize your enjoyment of mountain activities. Depending upon where they operate and other factors, a company may offer a vast array of guiding services or just a few. A company that provides guided rock climbing on just one cliff, during six months of the year, is very different from one that guides all types of alpine activities on several continents. A far-reaching guiding perspective requires guides with equally far-reaching skill and experience. Because of the risks inherent in climbing, and to a lesser extent in backcountry skiing, it is imperative that you learn and master appropriate safety techniques before venturing out on your own. Beyond essential safety techniques, there are many skills to master that will enhance your enjoyment of an activity. The best way to learn is from a committed professional instructor (also referred to as a guide) who works within the scope of a well-organized teaching progression. As is the case with professional guiding, professional instruction requires lots of personal interaction to be effective. In some environments an instructor/guide can effectively teach three students, but often two is a more realistic limit. For certain types of instruction, effective teaching may necessitate a single student. Beyond three students per instructor, the lack of individual attention and difficulty in accommodating different learning styles result in what we call a “supervised mountain experience”. Professional instruction programs are in the business of teaching skills. Some companies focus on teaching inexperienced students in just one activity, others offer instruction at all ability levels for several activities. Companies that offer a wide variety of instructional programs must have access to an equally wide variety of teaching resources in the mountains. Advanced instruction necessitates guides with advanced skills, and the communication and teaching ability required to share them effectively. Recognizing that not everyone is willing to invest in professional mountain guiding or professional instruction, a growing number of enterprising companies, and other organizations, promote and offer what we call “supervised mountain experiences”. These experiences are characterized by large groups with high client to guide ratios. Historically, this type of service was largely limited to camps, clubs and institutional settings and, until recently, there was not much demand for it. Today, many of these experiences are conducted by climbing gyms seeking an outdoor alternative for their indoor clientele, as “clinics” associated with various types of mountain festivals, and as a low-end alternative by companies who also offer professional guiding and instruction. The advantages of “supervised mountain experiences” are that they can be sold to participants at low cost and, because they are conducted with large groups, they offer a social environment that is not found in more traditional alpine pursuits. Less expensive than professional guiding or instruction, and apparently safer than climbing without any supervision, they seem to offer a good compromise for alpinists with modest aspirations, especially novices. The disadvantages of these experiences is that their inherently limited potential for supervision, interaction and scope, combined with high environmental and social impacts, result in significantly compromised experiences. Unwieldy group sizes and ratios limit safe instruction and guiding to the most basic levels. Even at those basic levels, instruction is rarely effective under these conditions. For novices, ineffective instruction lays a weak foundation of skills, which sometimes needs to be completely replaced before it can support intermediate and advanced skills. These compromises reduce the value of “supervised mountain experiences”, compared to professional guiding and instruction. At their worst, “supervised mountain experiences” can become a case of the “blind leading the blind”. When conducted by marginally qualified individuals, basic safety practices are sometimes absent and inept implementations of technique are common. With large groups, the role model offered by those conducting these experiences often rationalizes, or disregards, environmental and social impact, and leaves impressionable participants believing “this is how it’s done”. It’s not. Whether you seek instruction, guiding, or some of each, it is in your best interest to establish a professional relationship with an experienced mountain guide who can offer you a variety of services. A capable guide will quickly learn your likes and dislikes, as well as your abilities and limitations. Over time, a talented guide will help you develop new knowledge and capabilities. Like any skilled professional, a good guide’s value increases as he or she becomes more knowledgeable about how best to serve your particular needs. In a mature guiding relationship, the extra margin for error a guide must employ for clients without proven abilities is not required. Objectives can be more demanding  and more satisfying. Learn about an individual’s qualifications and personality before you consider hiring that person as your guide. Talk to him or her directly. You should be comfortable with the way your potential guide communicates and it should be immediately apparent that he or she has taken an interest in serving your needs. Don’t hesitate to ask for references. Establishing a relationship with one guide will ensure consistency, but a talented guide’s availability will often be limited. To facilitate scheduling, it may be more practical to work with two or three like-minded guides who have standardized methodologies and are comfortable sharing the particulars of “their” clients. For this reason, most top guides maintain a liaison of some type with similarly-experienced peers. In some cases independent guides will offer referrals. In other cases, several guides form an alliance, or partnership, to facilitate the marketing and delivery of their services, while still retaining their independence. Lastly, a mountain guide may work, with other guides, as an employee of a company offering guiding services or instruction. With some companies you have no control over who will guide you, and your guide has no control over who will be their clientele. You become little more than a body that needs to be moved up a mountain  sometimes with little regard for your experience, skills or preferences  and the guide/client relationship is depersonalized to the point where it becomes just a commodity. When mountain guiding is provided as a commodity, rather than a professional service, a personal relationship is not possible. Without it, the value of a mountain guide’s services is greatly diminished. Ultimately, your experience will be most significantly influenced by the individual who serves as your guide or instructor. Regardless of policies and practices that may influence their actions, your guide’s abilities and attitude will have more impact on your experience than anything else. If you do not know who will guide you, it is impossible to assess his or her suitability! Also, make sure you will not be handed off to another guide once you are in the mountains. To learn how we address the issues in this section please visit the About Us section of this site. There is simply no substitute for experience! Guides who bring thousands of days of professional mountain guiding to a situation possess an asset of considerable value. These individuals can often anticipate difficulties, and solve problems, that would stump less-experienced guides. They almost always move more quickly and efficiently, and they can often undertake more complex or difficult challenges with a greater margin of safety than their less-experienced peers. The most practical measure of experience is a guide’s total number of days of professional guiding. At an average of 200 days of guiding per year, a guide with ten years’ experience would have about 2,000 days of accumulated knowledge to offer. Those with more years, but fewer days each year, might have considerably less experience. The know-how that comes from consistent guiding over many years begins to come together for most guides after about 1,000 days of experience. For one reason or another, a large number of would-be professional guides move on to other endeavors before they accumulate this amount of experience  never reaching their potential. Those who work only occasionally are not professionals according to our definition, nor are those who work exclusively in the limited and controlled environments of climbing gyms, top-roped institutional climbing. Guides with abundant and broad experience are often more costly because they have far more to offer. An experienced guide is almost always worth the extra money. 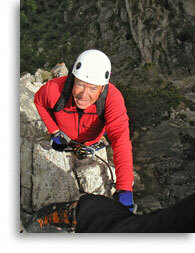 A mountain guide must be constantly aware of potential hazards. Good guides will check things, recheck them, and then check them all over again. It is essential for mountain guides to maintain the self-discipline that is required to avoid becoming complacent in situations where mistakes can have dire consequences. Although some mishaps are unavoidable, many guides go through their entire career without a serious accident  ask about a guide’s safety record. The mountains are an open door to some of life’s most powerful experiences. We can’t imagine how anyone could not be enthusiastic about the opportunity to share such experiences with others, but you don’t have to look far to find “burned out” guides. These disgruntled sourpusses aren’t much fun to be around, no matter how much experience or skill they have. Usually they have become disillusioned with guiding because it failed to meet their expectations in some way. Sadly, for these folks mountain guiding has become just a job  and a difficult one at that. They are often focused on how to extract as much as possible from their work, rather than on how to do their best on behalf of their clients. If it feels like your interests are being subjugated to your guide’s interests, or if your guide seems disgruntled, look for another guide  one who can still appreciate the wonder and awe of the mountains. On the opposite end of the spectrum, be wary of a guide who is boundlessly optimistic. Guides must believe in their clients but asking for performance far beyond a client’s capabilities is unrealistic. Being dragged through overly difficult terrain engenders little but frustration for the client. A talented guide will expose you to challenging objectives  not impossible ones. Communication skills are of paramount importance to a mountain guide. In a setting where intense physical and emotional experiences are commonplace, a skilled guide must be able to relate to people from a diversity of backgrounds, ages and experience levels. A guide must be able to anticipate how a person will likely respond in various situations and be able to provide clear, concise directions when needed. A guide must also possess a mature attitude and lots of patience  and a good guide will remain especially supportive, and enthusiastic, when the going gets tough. The ability to observe students’ learning progress and provide new information in just the right amount and at just the right time, is the essence of good teaching. A skilled teacher must sense when students are confused and when they are becoming disinterested; when they are scared and when they are confident; when they are exhausted and when they are up for a challenge. In short, a good teacher must step into the learner’s shoes and feel what they are feeling. An accomplished instructor must also be able to take complicated, and often abstract, concepts and break them down into simple, easy-to-understand components that the learner can absorb. 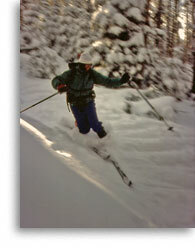 This is a tall order and the art of sharing alpine skills, through instruction or guiding, takes many years to develop. Mountain guides must be experts at their craft. Their movements should be controlled and calculated, even on challenging terrain, and their usage of equipment should be second-nature. 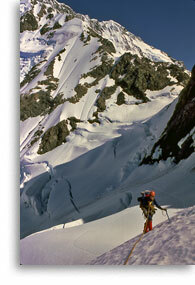 You can not become a competent mountain guide without first being an accomplished climber or skier. Keep in mind that the qualities frequently demonstrated by persons driven to perform at the top of a sport (obsession, impatience and a self-centered attitude) are at odds with the ones that facilitate effective guiding or teaching. A guide who strives to be the best possible climber or skier is fine, but the guide who strives to help YOU become the best possible alpinist is the one you want. Ask to see a guide’s climbing/skiing resume; it should be extensive, but if it focuses mostly on extreme accomplishments consider what relevance this has to you. A skilled guide will quickly and easily solve most complex technical and logistical problems found in the mountains. This ability comes only from having encountered, and learned from, an array of problems in a diversity of mountain environments. 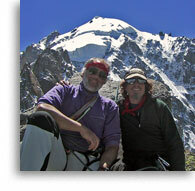 Seasoned guides often have climbing or skiing experience  sometimes extensive  throughout the world. Skills and knowledge gained in various complex and demanding mountain environments greatly enhance a guide’s ability to anticipate and avoid difficulties. They also enable a veteran guide to perceive opportunities that others, with a narrower focus, might miss. Look for a guide who offers a breadth of experience, both in terms of where they have climbed and skied, as well as the magnitude of their endeavors. 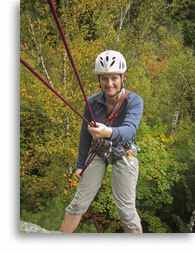 Professional mountain guiding requires specialized knowledge and skills. In addition to a high degree of competence as a recreational climber or skier, a mountain guide must be able to care effectively for the clients who entrust their safety to him or her. Because of the typically wide experience/skill gap between client and guide, traditional recreational solutions may not serve the guide, or client, particularly well. Myriad techniques and tools have evolved over a long period of time to meet specific technical aspects of professional guiding, and a competent guide must be capable of employing them when needed. A talented guide will have a large repertoire of techniques aimed at keeping you safe and comfortable, while helping you achieve your objectives. Guide training courses include this type of information, although they can’t provide the depth of experience required for mastery. Seasoned guides accumulate and refine their knowledge of specialized techniques, mastering them over years of experience. Ask a potential guide how, where and when they acquired their knowledge of specialized guiding techniques. There is certainly no one “right” way to teach any activity but random, or poorly organized, instruction always results in confusion for students. Therefore, it is important that a mountain guide learn, and adhere to, a consistent instructional methodology, based upon a carefully-designed progression of lessons. A well-developed methodology provides the framework, within which, a truly skilled instructor can address the unique needs of the individual student. Many guides are uncomfortable working within what they perceive to be the constraints of an instructional methodology. Still other guides are reluctant to teach at all, for fear their clients will lose their dependence and venture out without them. Sadly, few guides have been exposed to an effective teaching methodology  regardless of their experience  and even fewer have learned how beneficial it can be for their students. If you want to learn the skills required to climb independently, make sure you are purchasing instruction and not guiding. Also make sure your guide has a clear plan for exactly how your learning should progress. Typically this will be some type of instructional methodology you can review in advance. All too often “we’ll customize every aspect for you” really means “we’ll make it up as we go”. Competent guides must possess a thorough knowledge of climbing and skiing resources in the areas where they teach and guide. This allows them to pick and choose from a variety of instruction and guiding settings. When a favorite instruction area, or guiding route, is unavailable a good mountain guide will have other options in mind. Veteran guides are often familiar with hundreds of routes in their home area. Experienced guides may occasionally operate on unfamiliar terrain. This practice, known as “guiding blind”, introduces greater uncertainty and, with it, more adventure. Responsible guides will only guide blind with clients who desire this type of experience, and who have proven capabilities. Clients must also have a clear understanding of its added complexity and risk. In an environment where there is no one to call for medical assistance, it is imperative that mountain guides be capable of providing effective first-aid. A competent mountain guide will make every effort to avoid cause for first-aid, but should the need arise they must be prepared. The Wilderness First-Responder certification is a commonly accepted minimum standard in the mountain guiding industry. Some guides acquire the more advanced skills learned as an Emergency Medical Technician, especially those participating in mountain rescue services. To truly integrate first-aid skills one must practice them in actual emergencies, and the only practical way to accomplish this is as an active member of a rescue group or ambulance squad. Many novice guides acquire the foundation of specialized skills required to start their careers through the process of guide certification  a relatively recent option in the US. Formal certification guarantees that a guide has demonstrated the ability to apply guiding techniques effectively in a variety of situations. It sets standards upon which to start a career and build valuable experience. For well-established guides, who mastered the intricacies of specialized guiding techniques long ago, certification has little to offer and many of these highly-experienced individuals find this credential superfluous. In a few states (including New York), land managers employ licensing in an attempt to regulate the guiding industry. Although licensure in New York is predicated upon passing a test, and meeting other criteria, the standards required are very basic. A guide’s license is not so much a professional credential as it is a necessary endorsement if you wish to be paid to guide. Where required, a guide is legally obligated to possess a guide’s license. The actual usefulness of certification and licensing is limited. While suggesting a certain level of proficiency, neither can promise a superior standard of execution. A true commitment to excellence and the experience required to implement that commitment wisely are better predictors of performance. The subjective nature of these qualities makes them much harder to evaluate than a simple credential, but this process is well worth the effort when searching for someone who will literally hold your life in their hands. In any mountain environment there is a certain level of objective danger that can not be eliminated by any means. The nature of this danger varies considerably depending upon where you are and what you are doing in the mountains. In addition to this “background risk”, alpinists can make choices about how much additional danger to subject themselves to in pursuit of a particular goal. Some activities and goals involve relatively low amounts of danger and uncertainty; others demand a willingness to accept more risk. 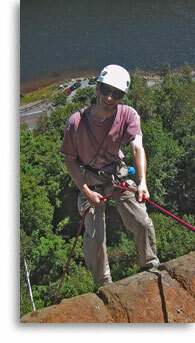 Although a guide can make you aware of risks, in many situations the danger can not be eliminated. Because people have widely varying comfort levels in the face of danger and uncertainty, guides routinely make adjustments to the amount of risk they expose their clients to in the mountains. Risk tolerance needs to be negotiated to the most conservative common denominator  or someone will be uncomfortable. A perceptive guide will not push you beyond your comfort level, nor will they allow you to push them beyond their comfort level. Guides are almost always exposed to dramatically greater risks than their clients but, although guides should be capable of performing at a high level, everyone has limits. More commonly, a guide may be uncomfortable with their client’s ability to meet the performance imperatives of a particular situation. Alpinists with extensive skills and experience are capable of making more informed decisions about risk than those who are new to the mountains and a good guide will take this into account  but not without first validating a client’s experience in the mountains. When undertaken judiciously, aggressive guiding allows clients to pursue otherwise unachievable objectives. When undertaken recklessly, aggressive guiding elevates risk to an unjustifiable level. Guides who express an eagerness to engage in aggressive risk-taking may be forgetting their responsibilities as professionals. Guides who seek absolute control over the risks limit the potential of their clients. Look for a guide who is willing to discuss risk tolerance, and how it will be determined in the guide-client relationship. The key to finding a good guide lies in finding a talented individual who loves to share the mountains with others  and has devoted himself or herself to that end. Mountain guiding, at its best, is more a calling than a career. It is a difficult, dangerous job  more so than money alone could ever justify. Only a handful of individuals are able to pursue satisfying careers as mountain guides, and they do it because the experiences they facilitate can have such a profound, positive impact on their clients. These people do not strive constantly to improve their skills and knowledge due to some external obligating force  they do it because they take pride in their work, and because they want to come as close to reaching their potential as they can. Guide services and climbing schools can range in size from a single individual offering their services, to a large company employing dozens of guides. Although your experience will be most significantly influenced by the individual who serves as your guide or instructor, it is also important to examine the company, large or small, that you will deal with in obtaining that individual’s services. Companies operate across a wide spectrum of quality within the largely unregulated mountain guiding industry. Within the scope of their activities, reputable companies will define and adhere to standards intended to encourage quality. Group sizes, client/guide ratios, business practices and many other criteria must be considered when evaluating a company. Most companies will attempt to focus your attention on their strengths, but to arrive at a useful picture of a company, you will need to scrutinize their weaknesses as well. You may wish to consider the following. Meaningful Comparisons  Don’t try to compare apples with oranges! Scope of programs can vary dramatically, sometimes to the point where a direct comparison is not even meaningful. For example, the experience of a dozen teenagers engaged in supervised climbing at a small local crag has very little in common with that of a client and guide attempting a large, complex climb in a major mountain range. Before you even start comparing companies you will need to determine the scope of the services you seek, and which companies offer those services. It is wise to do this with an eye toward the services you will likely seek in the future also. Ask about a company’s safety record. If they have had a serious accident find out how and why it happened. If this information is not forthcoming, look elsewhere. An accident alone is not reason enough to avoid a company, but keep in mind that many programs have operated in the mountains for years without a serious accident. Please feel free to inquire about our exceptional safety record. Any group of people entering a natural area, has an undeniable environmental impact. The larger the group, the greater the impact. 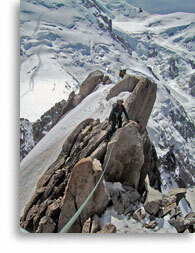 Alpine environments are typically very fragile and damage is difficult or impossible to reverse. Even the most assiduous efforts to avoid impact are ineffective within the context of a large group. All users of the mountains, from novices to seasoned professionals, must accept their responsibility as stewards of the natural resources they enjoy. Part of that responsibility is demonstrated by embracing sustainable, minimum impact practices. We believe large groups are environmentally unconscionable in a mountain setting. 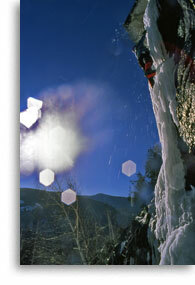 Groups of climbers and skiers must also recognize the social impacts of their activities. When a large group of climbers occupies several climbs for an extended time, in many cases they effectively take over a cliff, forcing others to climb elsewhere. On public lands, this inconsiderate behavior usurps the rights of others to share a limited resource and in some cases prevents them from climbing at all. Large groups of skiers and hikers, unless they are camping, don’t generally cause this type of impact but their presence in hordes does compromise the tranquility of wilderness for other users they might encounter. Because of this, we believe large groups are socially unconscionable in a mountain setting. Although there are clear and compelling arguments against large groups in the mountains, their presence is nonetheless fairly common. In a commercial setting, the impacts are sometimes rationalized against cost and profit  poor excuses in our judgment. Commercial and institutional activities collectively account for a large portion of environmental and social impact in the mountains  impact that could be dramatically reduced with smaller group sizes. So, what constitutes a large group? The answer depends to some degree upon what that group is doing but, we believe a group of more than ten people is always a large group in the mountains  too large. There are simply no places where a group this large can go without creating an excessive environmental and/or social burden on other users of public lands. In some environments, technical or physical constraints may even render a party of three burdensome. Make sure you know how large your group will be and how it will impact the environment and other users. We respect the fragile alpine environment, as well as the rights of others to use it, so we simply won’t go into the mountains with more than six clients and two guides in one area. We never permit more than two guides to operate in the same area, and the vast majority of our programs take place with a single guide and one, or sometimes two, clients. Visit our Encouraging Environmental Stewardship page to learn more. These determine how much individual attention you can possibly get and if the ratios grow too large, something’s got to give. With high ratios, either safety suffers due to a lack of supervision, or an instructor’s attention is diverted from teaching to just watching out for your safety  leaving little opportunity for instruction. In the case of guiding, high ratios effectively eliminate many potential objectives from consideration due to safety, time and other constraints. What would pass for a low student to instructor ratio in the controlled, safe environment of a schoolroom is utterly unwieldy in the complex and changing environment of the mountains. Teaching, and monitoring, the physical skills of climbing and skiing is an inherently hands-on undertaking, easily thwarted by high ratios. Ratios are directly linked to a business’s profitability and, in general, the more students an instructor teaches (or clients a guide guides) at one time, the more profitable the business. This is a strong temptation to “pack ‘em in”. If a company is reluctant to discuss its ratios, or tells you high ratios don’t limit their programs, plan on being one of the pack. At Alpine Adventures, safety, learning, and guiding flexibility come before profit, so we flatly refuse to exceed our clearly-stated ratios. Overall, our programs average about 1.2 clients per guide. We believe that companies offering technical programs with more than three clients per guide are placing secondary importance on these essential components of a meaningful experience. We know of no quality programs that do this. Visit our Promoting Effective Education page to learn more. There are few experiences more frustrating than being paired, for instruction or guiding, with someone of greatly differing ability. The resulting experience must be geared to the lowest common skill level, holding the stronger individual(s) back. Mismatched personalities can create an equally vexing situation. This is especially problematic for major trips where the mismatch may persist for an extended time and may even derail the trip objectives entirely. In some cases family or friends may wish to be together, despite ability disparities. In these instances guiding or instructional objectives must be secondary to the party’s social objectives. As long as this is clearly understood in advance, and the family or friends are not mixed with other people with different priorities, this arrangement can work very well. All reputable companies make an effort to avoid mismatched abilities  some do it better than others. Attempts to describe requisite skills to clients and then ask them to realistically evaluate their ability are fraught with difficulty because people’s self-perception varies so widely. Evaluating and matching personalities is even more difficult. The only truly effective way to avoid mismatches is to establish a professional relationship with a trusted guide and allow the guide, using first-hand knowledge, to match you with an appropriate partner  or avoid groups entirely. The vast majority of our programs take place with repeat customers in groups of just one or two clients with a guide. This personalized format makes it very easy for us to avoid mismatches. Additionally, we insist on getting to know clients in the Adirondacks, our home mountains, before we will arrange trips to the world’s far-flung places. A carefully-designed instructional methodology is essential for efficient learning. By delivering material in a logical, easy-to-understand sequence, it allows students to plan and gauge their learning progress. By eliminating overlaps and gaps in the flow of information, it maximizes learning time. A well-conceived methodology requires standardization of practices, a carefully constructed progression of lessons, and the flexibility to accommodate various learning styles. Comprehensive instructional methodologies take many years to develop and require an advanced understanding of the educational process as well as extensive mountain guiding experience. 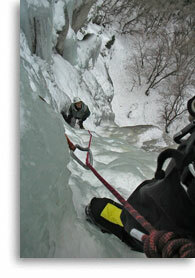 Well-developed instructional methodologies are few and far between in the mountain guiding industry. Without the continuity of an effective instructional methodology skills flow in a haphazard manner, resulting in confusion for the learner. More than a few instructors make things up as they go, leaving students, and sometimes themselves, wondering what will happen next. Frequently, what’s next is determined by the availability of resources, and their potential for entertainment, rather than a logical progression of skills. Entertainment is very much a part of skilled mountain guiding but, in an instructional setting, entertainment should supplement, not replace, skills acquisition. Our Alpine Mastery Methods are among the most well-developed instructional methodologies available. They assure systematic and consistent instruction, and they incorporate a means by which students can chart their learning progress. Within this sophisticated framework there is still adequate flexibility to meet individual variations in learning style and progress. Most importantly, while we love to guide, we equally enjoy teaching  and we recognize, and respect, the distinctions between these two services. You can’t learn to climb or ski indoors! Extensive and diverse mountain resources are required to effectively teach and guide these activities. Successful companies are usually based in the mountains, where they can conduct business year-round with easy access to optimum resources. Also keep in mind that top mountain guides, for reason of practicality, almost always live in the mountains. Although many companies, and guides, offer their services throughout a broad geographic area, most call a major mountain region home. The cliffs and slopes of the Adirondack Mountains offer some of the best teaching and guiding resources in North America, and that’s where most of our programs take place. Although we occasionally do make productive use of our indoor climbing wall and classroom, they serve only to supplement the vast mountain resource just outside our door. In addition to our Adirondack Mountain programs, we conduct private trips to mountain destinations throughout the world. 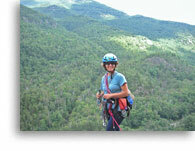 To learn more about the mountains we call home, visit our About The Adirondacks page. 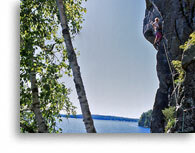 Climbing has experienced a tremendous growth surge recently and there are many new companies in the industry. Other companies are well-established, with many years of experience. An experienced company can certainly hire an inexperienced guide and, conversely, an experienced guide can work for, or own, an inexperienced company. Consider the company and the guide. You should carefully investigate a company’s policies regarding deposits, payments, cancellations, credits, refunds and the like. Will your program be canceled, or will the cost change, if someone, over whom you have no control, fails to show up? Will you receive a refund or credit if the program can’t be completed due to weather or other circumstances? Each company has its own policies and there is no standardization within the mountain guiding industry in this area. Make sure policies are clear and seem reasonable to you. Companies that block out a top guide’s schedule, to accommodate your booking, normally require advance payment to guarantee the reservation. Bookings in the mountain guiding industry are often for several consecutive days and, unlike professionals who may book clients for an hour or less  and can afford an occasional missed appointment, mountain guides simply can not afford to lose several days of income because someone didn’t show up. Companies that demand very little commitment from their clientele typically provide guiding as a depersonalized commodity rather than a professional service. 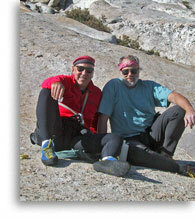 Alpine Adventures has been in business since 1985 and we’ll be around for many years to come. To learn more please visit our Company History page. To learn more about our business practices please read Our Policies. In some cases, land managers regulate the mountain guiding industry’s impact on a place with commercial use permits. In areas where permits are required, a company must possess one to guide legally. Permits, in addition to regulating land use, can serve to limit a company’s competition. In some instances a single company retains exclusive rights to an area’s commercial mountain guiding activities, in others several companies share these rights. Permits tell you little about the quality of a company’s services. Accreditation attempts to assure consumers that a company has met minimum standards for the mountain guiding industry. Although the concept of accreditation has appeal  for both consumers and companies  its implementation has been at the lowest common denominator of acceptable practices. Because of this, accreditation can promise only mediocrity at best. To secure a quality experience you will need to look beyond accreditation. 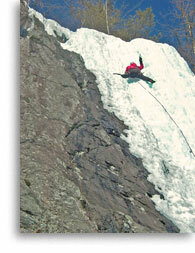 In the Adirondack Mountains, mountain guiding is regulated through licensure rather than permits and all Alpine Adventures guides are licensed by New York State. Because accreditation has been implemented at such a low standard we feel this credential can be misleading. Rather than suggest you rely on a questionable credential, we encourage you to become an informed consumer. To this end, we are always eager to discuss any aspect of our programs or business. A company’s rate structure has a lot to do with its profitability. Rates can be structured to encourage small groups and personalized service or larger, less personal experiences. Some companies try to do both. Reputable companies all place limits on group size, client/guide ratios, guide qualifications and client qualifications for each specific type of service they provide. These limits may vary from one service to another, but they must be clearly spelled out for you to make an accurate assessment of value for each service. Although low cost is always enticing, it’s no bargain when you are purchasing a severely compromised experience. Make sure you understand not only how much you will pay, but what you will get in return. Low ratios are almost always worth the extra cost. Our programs are, by no means, the least expensive available. Because value is a function of what you get for your money, as well as how much you pay for it, price alone is misleading. We describe our programs in as much detail as possible so you can determine what you will receive for your investment in our services  and we welcome any additional questions you might have. Our clients tell us our programs are an excellent value because of the quantity of relevant information we deliver and the quality of the experiences they enjoy. This is confirmed by our extremely high level of repeat business. 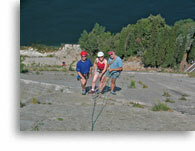 To learn more about our rate structure please visit Arrange An Adventure. Copyright © 2004-2015 Alpine Adventures, Inc.